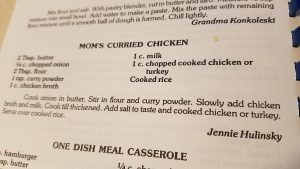 When I think about my favorite foods at Grandma’s house while I was growing up, Curried Chicken and Rice is definitely at the top of the list. Along with kolaches and homemade banana bread. And Tang. Bleh. How did I ever drink that stuff?! But I think everything always tasted amazing at Grandma’s house for some reason. Even regular ole’ spaghetti. A simple lettuce salad always tasted better at Grandma’s house too but that may have been because Grandma always had bacon bits. This recipe is warm, hearty and SIMPLE – the perfect characteristics for a delicious weeknight meal. Plus, it’s a great way to use up leftover chicken. Often times, I’ll make extra chicken for one meal with the intent to use the leftovers for this recipe. It’s also one of my go-to recipes when I need to use up the milk in the fridge that’s about to expire. The curry sauce also freezes really well. I’ll freeze individual servings and then thaw it out when I have leftover rice on hand, say after Taco Night. 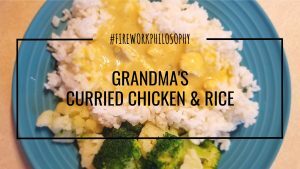 Pair the leftover rice and a serving of leftover curry and BAM! Lunch is ready to go for the next day! 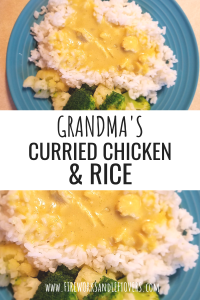 The picky-eater Farmer won’t eat Curried Chicken of course, but Little E loves it, so I often make this on a night I know The Farmer won’t be home for dinner. Or if he his, I’ll make him his rescue burger. I call it the rescue burger because it’s an option that rescues him from either starving or resorting to eating an entire bag of chips because he wasn’t a fan of what was on the menu for dinner. 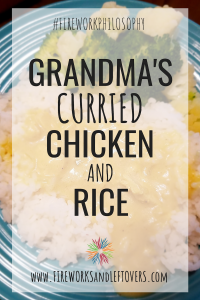 I hope you enjoy my Grandma’s Curried Chicken and Rice as much as I do and that it will bring about cherished memories at the dinner table for your family too. 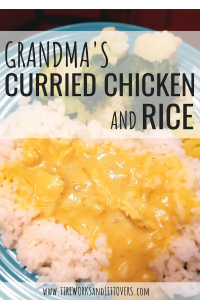 Grandma's Curried Chicken & Rice is a quick and easy family favorite and a great way to use up leftovers from the fridge. Melt butter in a saucepan and cook onion in butter until translucent. Stir in flour and curry powder. Slowly add chicken broth and milk. Cook until thickened. Add salt to taste and cooked chicken or turkey. Cook until meat is warmed through. TIP: The original recipe calls for 2 tablespoons of flour and 1 teaspoon of curry powder. I usually add extra flour to thicken the sauce a little more and extra curry powder to really hit home the warm, curry flavor. TIP: Freeze single servings of leftover curry sauce to pair with leftover rice so you have lunch ready to take to work the next day.